Welcome to Balkan Marble Industries Ltd. (BMI), extra white marble quarry. 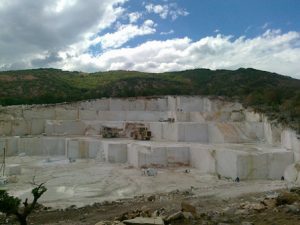 Balkan Marble Industries Ltd. (BMI) was formed in 2007 and has signed two concession contracts with the Macedonian Ministry of Economy for the exploitation of white marble situated in the locality of Veprcani village in the greater area of the city of Prilep. Both concession contracts are valid until 2026, with the option or extension for an additional period of 20 years. The area of Prilep is known from the ancient years for its superior crystallized white marble. Total concession area covers 5.5km2, making it one of the world’s biggest concessions exploited by a single company. Quarry is located at 40km of road distance to Prilep town, the distance between quarry and Thessaloniki port, Greece is about 200km.